what beer goes best with oysters? 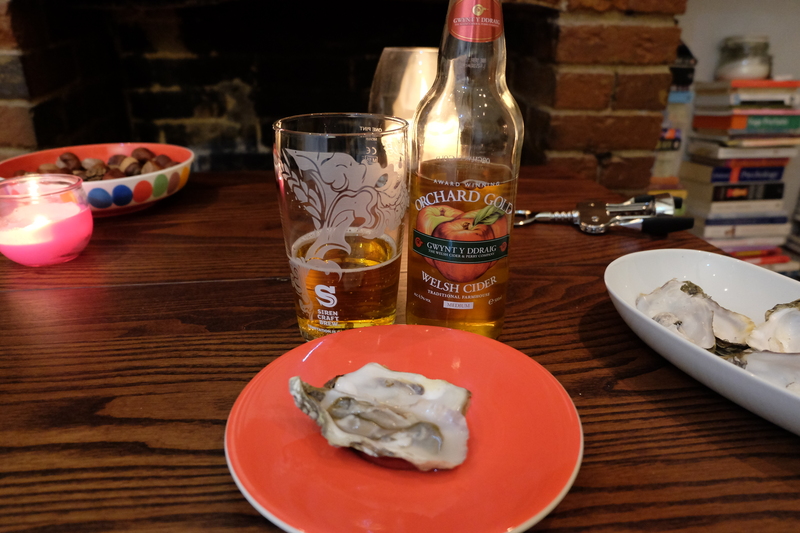 – MostlyAboutBeer……..
what beer goes best with oysters? I’ve never had oysters with beer before but I’ve read a few recommendations on the best beer to serve them with. Sources range from notes by Michael Jackson, Martyn Cornell and Garrett Oliver. We also visited to the Forge in Whitstable – a seafood and beer cabin on the sea front. At the time, I stuck to my favourite: beer battered skate. 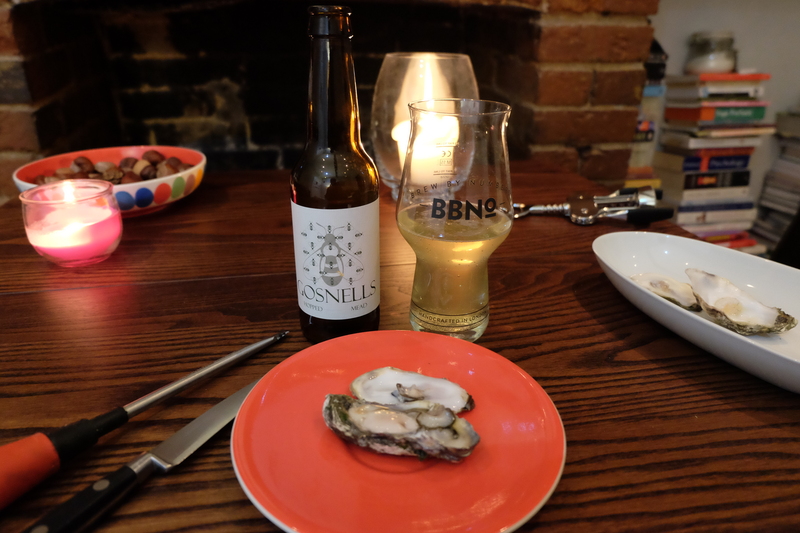 I’ve put together a sextet of the kind of drinks that keep coming up in relation to oysters which includes two non-beers of a similar alcoholic strength: a cider and my own wildcard based on nothing but intuition – a hopped mead! The oysters are from Kent and were bought for 79 pence each from Waitrose (a posh British supermarket). I don’t possess an oyster shucker so had to rely mainly on innovative violence. Also, be prepared for what might visit you in the night. This Belgian blonde is a good example of the style I was going for: spicy with a bouquet of hay/wet straw and a touch of candy – something I get with many session strength Belgian beers. The effect when you swallow the oyster is to get savours on a few levels: the herbal, the sweet and the salty. This beer glows with a sweet warmth afterwards like it’s trying to cook the oyster internally. It brought some colour to the cheeks. It’s more than a match for the oyster’s abrasiveness. 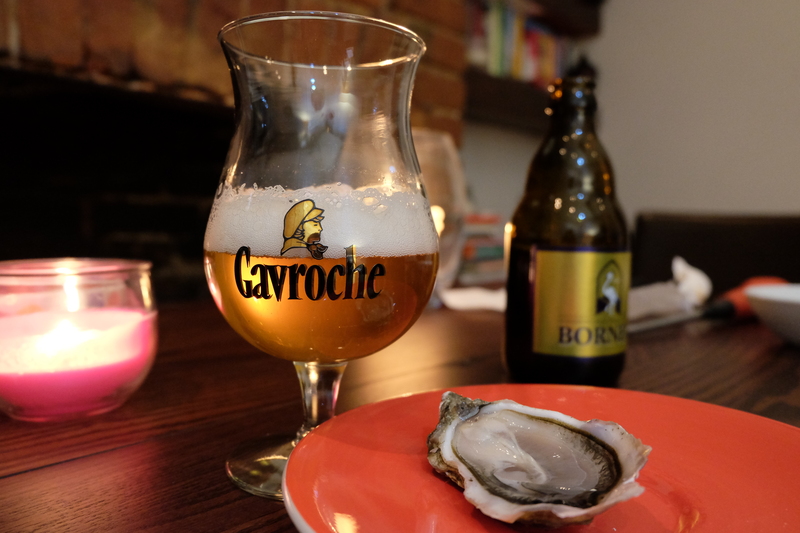 Bornem is also very carbonated and this helps to absorb the mollusc’s potency too. My stab in the dark: it’s intoxicatingly sweet on the nose before you even sip it. Obviously, it honks of honey and has quite a sweaty dimension too not unlike malty bitter (though there is no malt in the mead). The honey sticks to the lips, palate and gullet. I can’t really detect any hops in there. When I devour the oyster, there are no shared attributes. The cloying sweetness and the incoming salty tide complement each other like a boat crash. The counterintuitive tang you get with things like salted caramel does not work here. Also, the mead has absolutely no dryness or bitterness to temper the coarse bivalve. I should make very clear that Gosnell’s has never claimed or implied that its products complement oysters. The miscalculation was all mine. This beer has a huge charge of carbonation like a wave surging up a Sussex chalk cleft so this could be a good sign. It’s dessicatingly dry on the nose – the archetypal horse blanket. It’s so dry, your sinuses stick together when you inhale it. It’s this very aridity that carries the oyster in a similar way that Champagne might. The salt is ingested almost unnoticed. The Geuze is so chewy it makes up for the lack of mastication on the shelled protagonist. 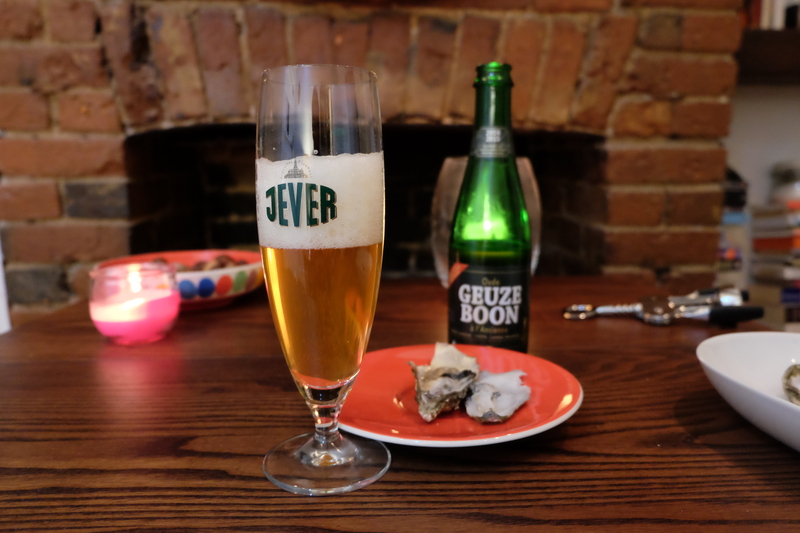 Drinking the Geuze is almost like eating meat; the seasoned protein lent by the oyster became just part of a larger platter. As a child of Gwynedd in North Wales I can tell you this means dragon’s breath (actually – wind of the dragon but I’m sure they’re referring to a blast from the upper body). Oddly, I can’t really smell any apple flesh on it. It smells a little bit like gas (about this “wind”…). The palate, however, is very different. There’s much less sourness or acidity than I’d anticipated for a medium cider. To me, this is as sweet as a perry. It verges on butterscotch. On the eye, it has a gorgeous glow like liquid amber. Into this whirlpool the oyster vanishes. The cider strips away the salt. It works. The oyster’s aggressive character has been disarmed. Possibly, it would’ve worked even better with a bitter edge to the cider. It remains too sweet for my palate. 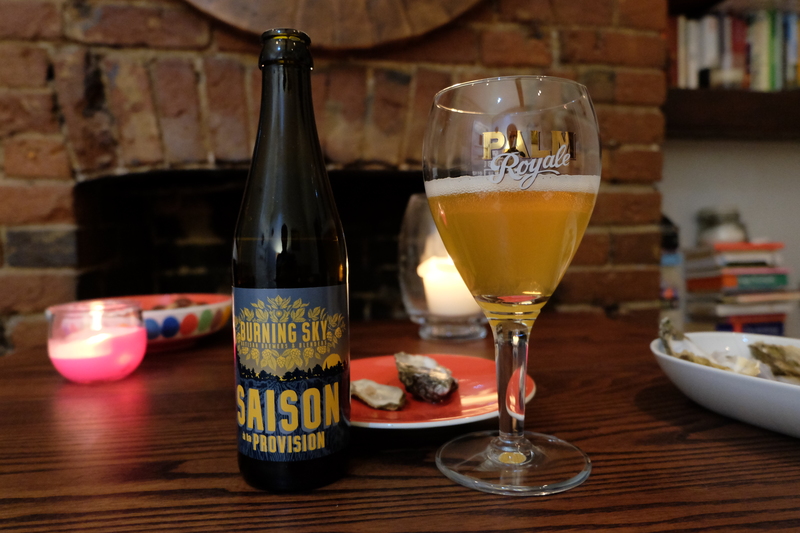 Unfortunately I couldn’t get my preferred choice and benchmark – Saison Dupont. Burning Sky’s equally crafted Saison has dried grass on the aroma. It’s musty and sticky like an Altbier with tangy decaying apples and a very dry finish. The oyster slips down and mirrors the dryness in its salt. Another sip and this is a viable marriage – a midway tide of savoury washes in. They’re like sensory echoes of each other. It’s a milder experience of the Oude Geuze. The porter doesn’t leap up to be drunk like a lot of the other candidates. The carbonation doesn’t surge because it’s a porter: it’s rich and creamy with chocolate powder on the nose. It’s smooth-bodied and just holds back from being sweet. Introducing the oyster is a shock to the system and stands for everything the porter isn’t. For a moment I fear a mismatch but it works very well. It’s a bit like the balance of extremes between a rich creamy salty cheese and a bitter hoppy IPA. 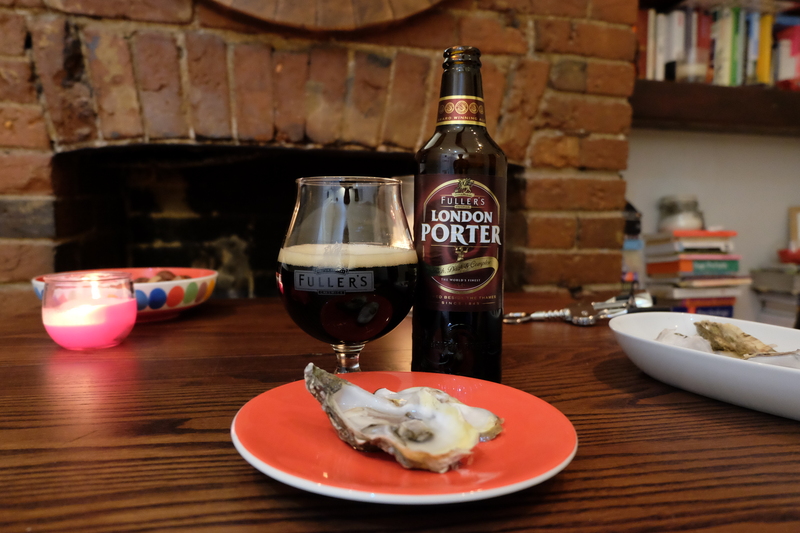 In this case, the sharp edges come from the oyster and the porter simply engulfs them in its warm mammalian arms. The whole chocolate roasted dimension kicks in afterwards too giving this pairing added layers. With oysters, the Champagne, Muscadet and white wine are gradually rolling over to be replaced by beer to the point that they might soon top the pairing lists in restaurants. As ever, beer has the ability to be more versatile. This is proven after popping the six bottles and battling with the six shells, my own bias is for the Oude Geuze and the London Porter. The former is an overpowering brute while the latter neutralises the threat with a cuddle. I suspect that you took one for the team there. Never had oysters but despite your later post as warning, your review here makes me want to try!